Should IndyCar Change the Rules? When we were at Barber Motorsports Park a couple of weeks ago, there was a Saturday press conference that Susan and I both attended. 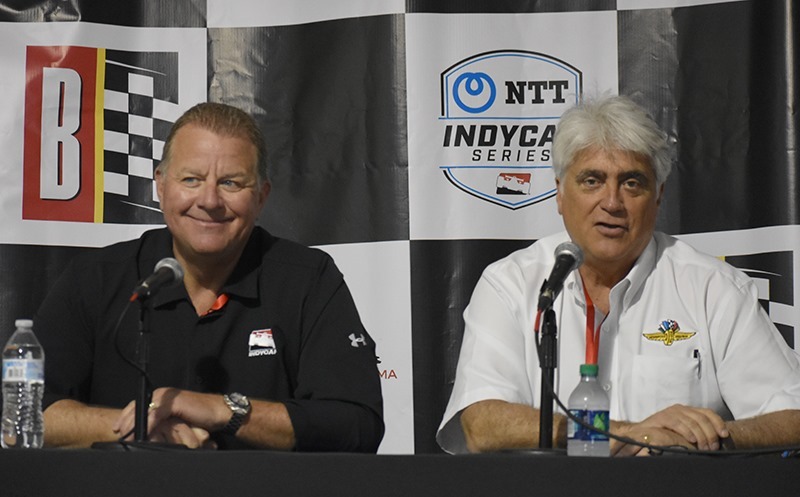 It featured Hulman & Company CEO Mark Miles, and IndyCar President Jay Frye. There were no bombshells planned for the gathering, but more of a chance for the media to ask questions of the two of them. I’ve attended a lot of IndyCar press conferences over the years. In that entire time, I’ve asked a total of one question – and that was to Josef Newgarden when he won Barber in 2017 (and I don’t even remember what the question was). But just because I don’t ask questions, doesn’t mean I don’t listen or make my own observations. I’ve learned a lot just keeping my mouth shut and listening at press conferences. David Malsher, the excellent author and journalist from Motorsport.com, asked Jay Frye an interesting question in this particular press conference. If you’ve never heard Malsher’s voice; he sounds like a combination of actor Alan Rickman, and Tom Carnegie with a British accent. It’s one of those voices you could just listen to all day long. His question pertained to the possibility of a third engine manufacturer coming on board. With the new 2.4-liter formula scheduled to run for the 2021 season, time is quickly running out for a new OEM to come on board in time to have an engine ready for testing in 2020. Whenever you quote a year in the next decade, it sounds like it’s way off into the future. The year 2020 is less than nine months away. That shows how quickly the deadline is approaching. Malsher’s question was (paraphrasing): If an engine manufacturer could not commit to 2021, but they could for 2022 – would IndyCar consider pushing everything back another year? The question surprised me, but so did Frye’s answer. In a nutshell, Frye said that even though everything is full speed ahead with IndyCar, Chevy and Honda having the new 2.4 liter engine on the track for testing in 2020 and racing in 2021 – they would consider pushing everything back. Quite honestly, I’m not sure what I think about that. Obviously, there would have to be a definite and firm commitment on the front-end by the potential new OEM – financial or other means, in order to change everyone’s plans. This timetable has been in place for a while now, and both Honda and Chevy have been diligently working toward it. Suddenly, you’re asking things to come to a halt for a year just to allow a third manufacturer – who previously had no skin in the game – to dictate terms? That’s a big concession if you ask me. Then again, how bad do Chevy and Honda want a third manufacturer that’s actually competitive? Competitive is the key word here. It does no one any good whatsoever to have another Lotus situation on our hands. If you’ll recall, Lotus got a late start with their turbocharged V6 engine that was to be ready to race in 2012. The result was disastrous. All but one team bailed on Lotus before the Indianapolis 500, and Honda and Chevy had to supply more engines than they had planned for. The series got a black eye over the whole fiasco and a proud name from the history of The Speedway, suddenly became a punchline. Seven years later, the name Lotus still brings out jokes and head-shaking. Honda and Chevrolet walk a fine line. They desperately want a third engine manufacturer, and they want that engine to be competitive, but not too competitive. Imagine the outcry if IndyCar bent over backwards and met all the demands of a potential third engine builder, with Chevy and Honda biting their collective tongues. Then when the three started competing on the track against one another, the new manufacturer mopped up. Do you think Chevy and Honda will just write it off to good competition? No. They will be furious. Many of you are remembering the Lotus situation and thinking it could never happen; that a new manufacturer could come in and be superior. You think that an engine company needs time in the series to figure it out. Remember the Ford-Cosworth XB that was introduced in 1992? It was competitive right out of the gate and it became the engine of choice for years to come. How about IndyCar in 2003? Chevy was the dominant engine and had just driven Infiniti out of the series the year before. Here came Honda and Toyota from CART to make their IndyCar debut with a completely different engine than they had been running in CART, that was normally aspirated. Toyota won the Indianapolis 500 and the championship in 2003. Honda was extremely competitive in 2003, and won the championship and the “500” in 2004 – and ultimately drove Chevy and Toyota out of the series at the end of the 2005 season. So don’t think a new engine can’t be competitive and even dominant in its first season. David Malsher has raised a question that I’m not sure there is a correct answer for. My wife will tell you that I am very rigid and inflexible. I don’t think I’m that bad, but I do feel that deadlines and timetables exist for a reason – and they are not to be toyed with. But I also think that IndyCar should not be so inflexible that they drive away a potential longtime third partner – that might possibly lead to even a fourth manufacturer. How good would that be? In 1998, CART had five chassis manufacturers with Lola, Reynard, Penske, Swift and Eagle and four engine manufacturers in Ford, Mercedes, Honda and Toyota. I’m pretty sure we are locked into Dallara being the only chassis provider for the next several years, but the series needs more engine manufacturers, if it is to grow as it needs to. They may not get to where they need to go, if they are not open to extending deadlines and revising timetables. I think Jay Frye is the most capable leader for the series and open-wheel racing that I’ve seen possibly in my lifetime. It’s considered heresy to ever make a comment against Tony Hulman, who did so much good for the sport. He saved The Speedway from the wrecking ball, when he bought the track in 1945. He poured time, money and effort into making it the facility it became in the fifties and sixties. He also founded USAC as a sanctioning body, when AAA pulled out after the deadly 1955 racing season. But he also allowed USAC to become a poorly run operation by the mid-seventies, and that prompted the original split in 1979. In my opinion, Jay Frye is the best I’ve seen at the head of open-wheel racing in this country – ever. That’s why I feel very confident that, if and when the time comes to make a decision on extending the timeline on the new 2.4 liter engine, Jay Frye will make the right call and he should be supported either way. I trust his vision. But it is a very interesting question to ponder. What say you? This entry was posted on April 17, 2019 at 4:03 am and is filed under IndyCar. You can follow any responses to this entry through the RSS 2.0 feed. You can leave a response, or trackback from your own site. A change in this engine schedule would be okay with me as long as Chevy and Honda were in agreement. But I just read in the Indy Star that Ganassi has now joined Penske in lobbying for guaranteed entries for into the Indy 500. I strongly disagree with that rule change, but sadly if those two want it I guess it won’t be long. You’d be hard-put to come up with an idea that is more of a slap in the face to the traditions of the Indianapolis 500. I don’t understand why they would have to delay it a year. Why can’t Honda and Chevy come out with the engine in 2021 and then Manufacturer X joins up in 2022? I wouldn’t think that would put them at any huge disadvantage, they could watch what’s happening with the other two brands and develop accordingly throughout 2021, and then show up ready to go in 2022. Right? What am I missing there? You make an excellent point. I can understand the delay to keep all the engines on an equal footing, but when new teams want to enter the series the other teams don’t dial back for a year. That’s what I immediately thought when reading the blog. Then I thought an engine maker can begin development today and be ready by February 2021. Great description of David Malsher’s voice. I think Frye doesn’t want to do anything to push a third OEM away, so he’s leaving all options open. The series desperately needs this third engine. I really dont think they need to delay it. I think a third mfg would wait till 2022 , that way they could have their engine fully developed. I would be very surprised if Chevrolet and Honda were not heavily involved with and approving of any accommodations made for a third manufacturer. I think you are quite right on that point. I voted yes based on the many stories I have read that both Honda and Chevy will be involved in any agreements with additional OEMs. Brandon made a very good point which would be a good middle ground. Just by asking that question, Malsher slightly tips his hand. It leads to the suspicion that a third manufacturer wants to join, but cannot meet the deadline. The question posed by Malsher is hypothetical but not accidental. Essentially, Frye is testing the waters with his response. But IndyCar, Honda and Chevy would be foolish to hold up a third engine manufacturer. Blind adherence to a timetable in this situation would be counterproductive.